The best sanitation facilities are those that meet needs for sanitary disposal of human excreta and wash water as well as meeting needs for security and dignity. This page is an Introduction to Sanitation Facilities, Part 2. 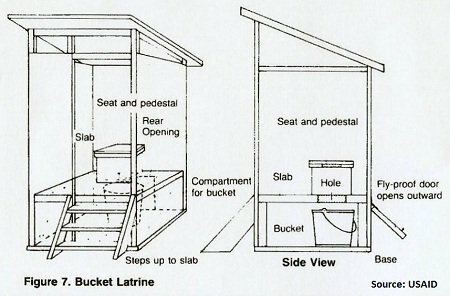 See Introduction to Sanitation Facilities, Part 1 for an introduction to basic pit latrines and improved pit latrines. 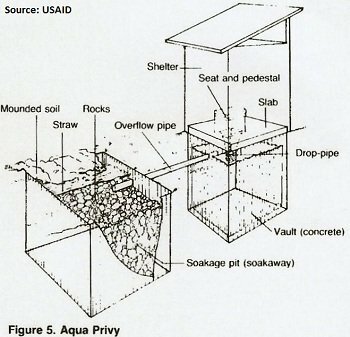 An “aqua privy” is yet another way to improve on the pit latrine. An aqua privy has a water-filled and water tight pit beneath it. Bacteria in the pit break down the excreta. 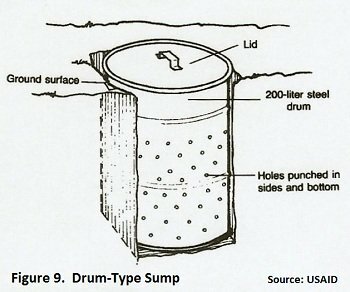 The solids settle to the bottom of the pit and excess liquid flows through an overflow pipe to a soak-away pit (Figure 5). 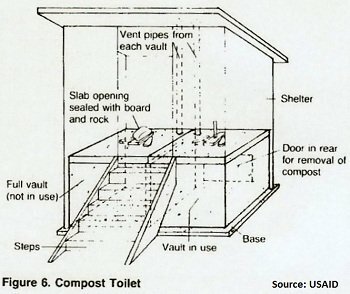 “Compost toilets” are pit latrines designed to utilize other added organic wastes in the process of creating compost material which can then be used as fertilizer for crops (Figure 6). Operation and maintenance of composting toilets are relatively simple and do not require special skills or equipment. “Bucket latrines” are simple to construct but require more maintenance than pit latrines. The contents of the full bucket must be removed every couple of days and properly buried (Figure 7). The method of waste disposal used by a particular community depends on many factors including construction costs and maintenance costs, availability of water, and skills of those involved in such things as pit latrine slab design and slab construction, shelter design and shelter construction, pit design and pit construction . It also depends upon the skills of those maintaining the latrines, the materials available, and the population density of the community. Various customs and cultural considerations will invariably influence decisions concerning methods and practices related to adequate sanitation. These should never be under-valued and may well determine the success or failure of efforts to improve such sanitary practices. 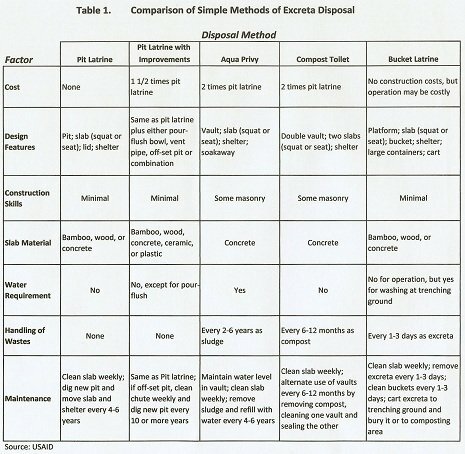 Table 1 shows a comparison of different methods of waste disposal. In addition to sanitary disposal of human excreta, it is important that the community also have an agreed upon method of disposing wash water (gray water). Water used for washing, bathing, or cooking also presents a source of contamination if not disposed of correctly. Gray water haphazardly disposed of may contaminate drinking water supplies or form surface pools and puddles where mosquitoes can breed. Best sanitation methods of gray water disposal include several options. 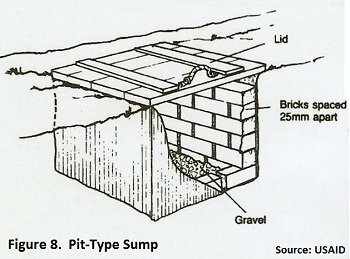 Sumps contain and isolate waste wash water and allow it to slowly soak into the surrounding permeable soil (Figure 8 and 9). Soakage pits work in a similar way but water may be poured into a drain located in a dwelling. The gray water then travels through a pipe to the pit where it can soak into the ground (Figure 10). 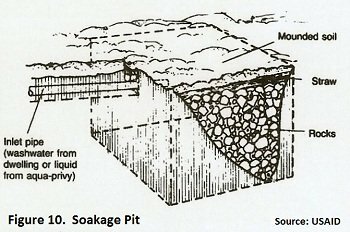 Soakage trenches are similar to soakage pits, but construction is more involved. Soakage pits may be more applicable where groundwater levels are shallow (Figure 11). 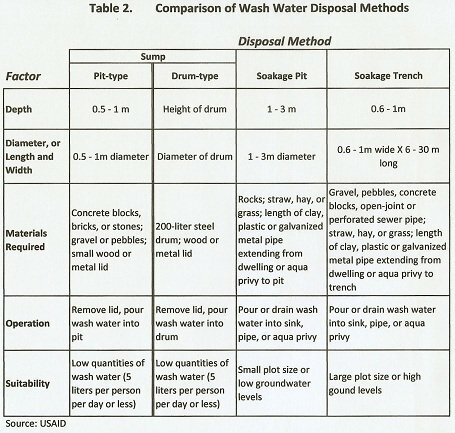 Table 2 compares these different methods of wash water disposal. Again, as with human waste disposal, the best sanitation practices contain and confine the contaminated material from any water source and to prevent the spread of disease through the activities of humans, animals, or insects. Adequate sanitation also provides for the security, privacy, and dignity of those who use the facilities. Return "Home" from "Best Sanitation"